After the passport control the excursion starts with a Catamaran boat at the harbour of Kos Town. Both excursions start with a 1 hour 15 minutes cruise on a fast catamaran from Kos to Didim. From the port in Didim, these guided tours move on by A/C buses to the ancient sites according to the schedules outlined in this brochure. Didim, home of the antique city of Didyma with its ancient Temple of Apollo, is a small town and a popular seaside resort on the Aegean coast of Western Turkey. This ancient city, originally a pre-Greek cult sanctuary, was established as a colony of Myceane and then Crete in the 16th century BC and subsequently possessed by Persians, Ancient Romans, and Byzantines as part of the province of Caria. This coast has thus become a very popular holiday resort and is genuinely attractive with its long sandy beaches, turquoise bays, ancient ruins to visit, and its own microclimate, benefiting from hundreds of days of sun every year. 08.30 Departure from Kos (by Fast Catamaran). 10:00 Departure from Didim port to House of Virgin Mary. 11:00 Visiting House of Virgin Mary (duration 1 hour). 13:30 Ephesus Tour (duration 1 hour 30 minutes). 15:15 Coffee Break & Bazaar (duration 45 minutes). 17:20 Departure from Didim Port. Ephesus ...The ancient Metropolis devoted to the Goddess Artemis. “He who had laid eyes on it once will be convinced that the world of the immortal gods has moved from the heaven to earth" said the ancient poet Philon who saw the Temple of Artemis in Ephesus. 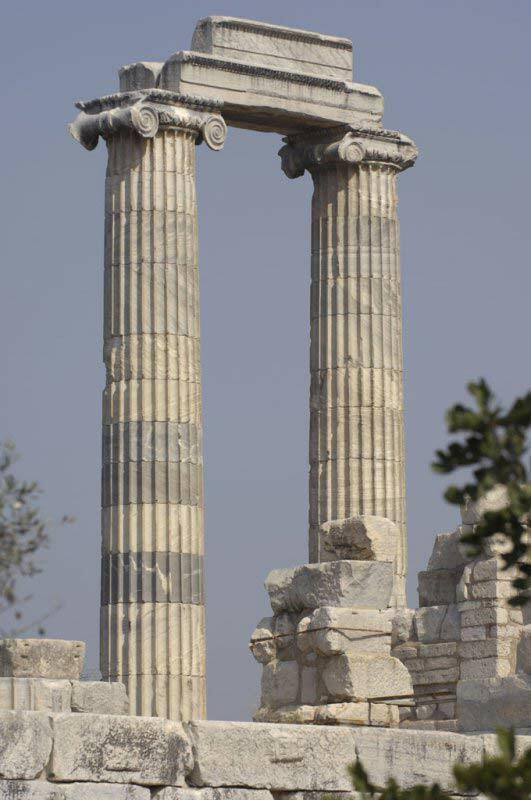 Temple of Artemis is known as one of the Seven Wonders of the World in ancient times. 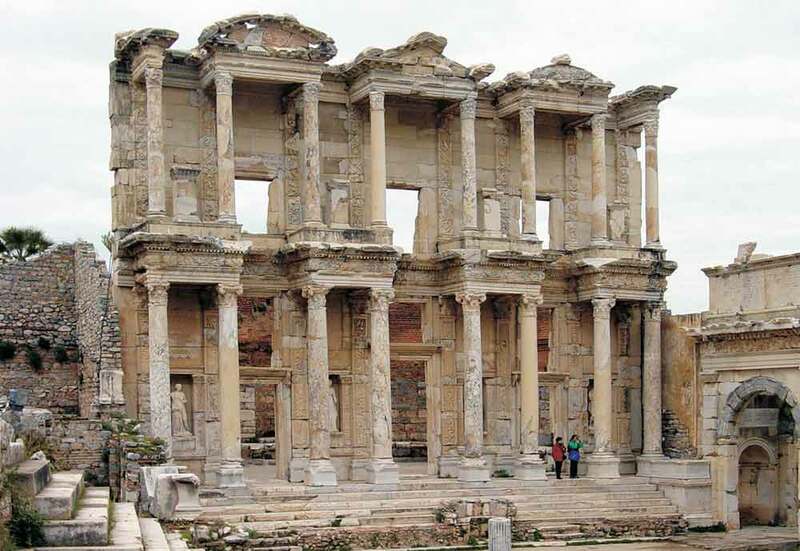 Celsus Library: This elegant monument with the delicate details of Roman architecture was built in AD 135. 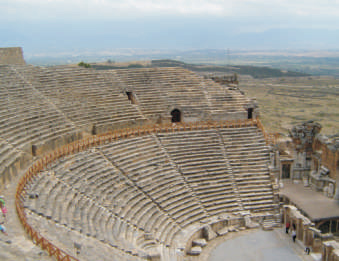 Great Theatre: The largest structure of Ephesus was originally built in the 3rd century BC and was later updated by the Romans in the 1th century AD when it had a seating capacity of 25.000. Other major spectacular attractions of this historical city. Temple of Hadrian and The Curetes Street. 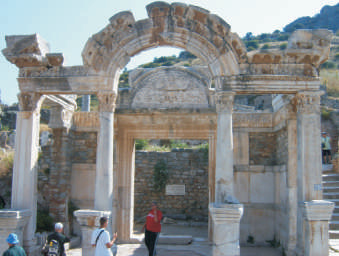 Ephesus is also the religious center of the early Christianity and today. St John’s Basilica is the primary feature of the holy architectures in this ancient town. 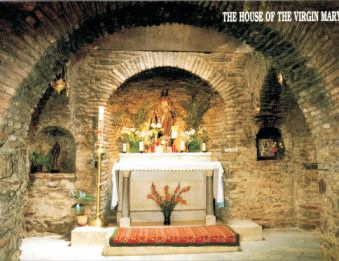 Located on the top of the "Bulbul" mountain 9 km ahead of Ephesus, the House of Virgin Mary enjoys a marvelous atmosphere hidden in the green. It is the place where Mary may have spent her last days. Indeed, she may have come in the area together with Saint John, who spent several years in the area to spread Christianity. In the 4th century AD, a church, combining her house and grave, has been built. IONIAN ODYSSEY ON TURKISH COAST. Didyma ...Oracle Shrine of Apollo. 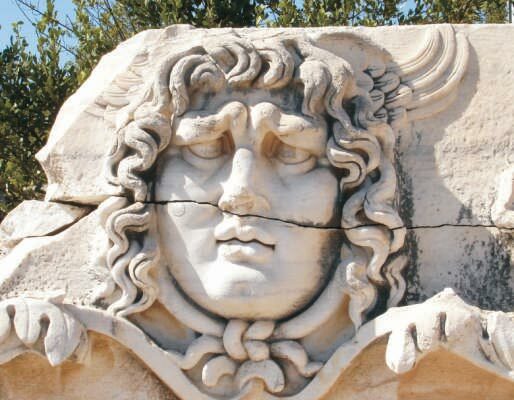 Hidden among rolling hills only a few miles from the scenic coast of southwestern Turkey, the ancient site of Didyma is famous from legendary times. Here was a natural spring where the beautiful Leto is supposed to have spent an hour of love with Zeus, then giving birth to the twins Artemis and Apollo (didimi in Greek). 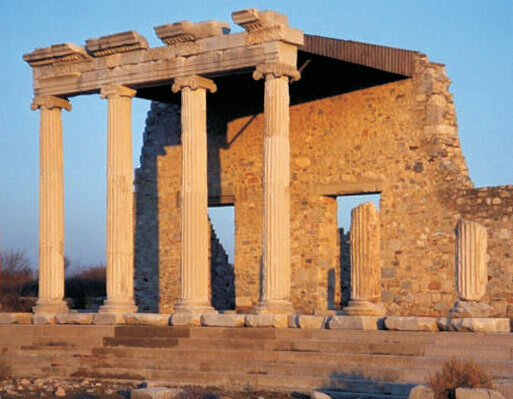 The most important oracle site in Asia Minor, its pronouncements to Croesus, Alexander the Great and other great kings altered the course of human history. The most dramatic feature is the ruins of Ionic Temple of Apollo which remains overwhelming, both by its enormity and intricacy. The flawless carved marble – much of it suspended nearly 100 feet off the ground- represents a classical Greek exercise in perfection. This temple, measuring 51 by 110 meters, was the third largest structure of the Hellenistic world, being exceeded in size only by those at Ephesus and Samos; however it outlasted them both. 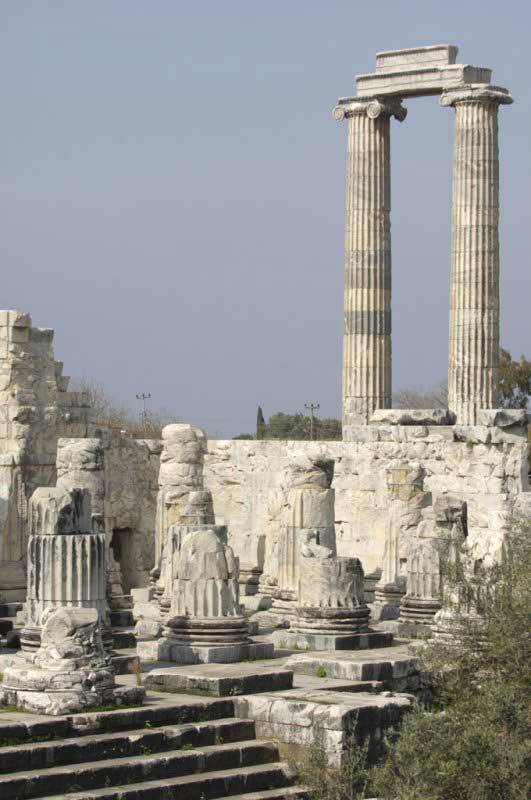 The temple of Apollo (Didymaion), preeminently famous as an oracle site, was the largest and wealthiest Ionic temple in Anatolia and was renowned for its holy relics, its treasury, its sacred spring and sacred laurel grove. The temple attracted pilgrims, lovers, merchants and kings alike for centuries seeking advice from the oracle of Apollo. The ancient city of Miletus, the oldest and the most powerful of the 12 Ionian cities of Asia Minor, reigned as the cultural, commercial and intellectual center of Ionia. 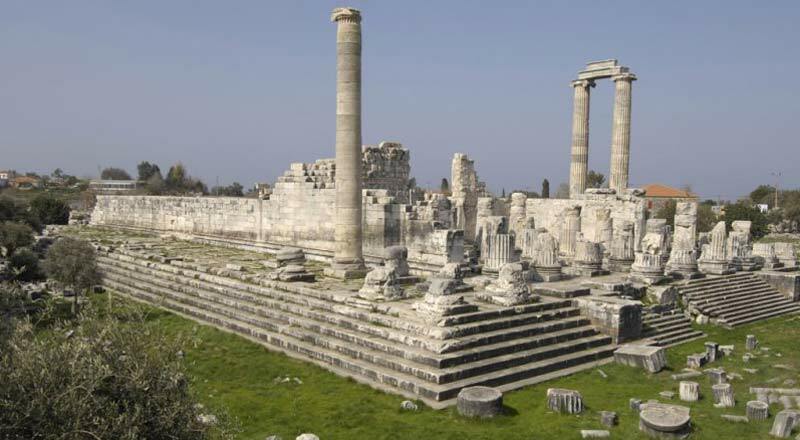 Western philosophy originated in Miletus and it is the native city of Thales. The Miletus alphabet was accepted as the normal script employed in writing ancient Greek. The first coins were minted in this city and exact weight measures were established. 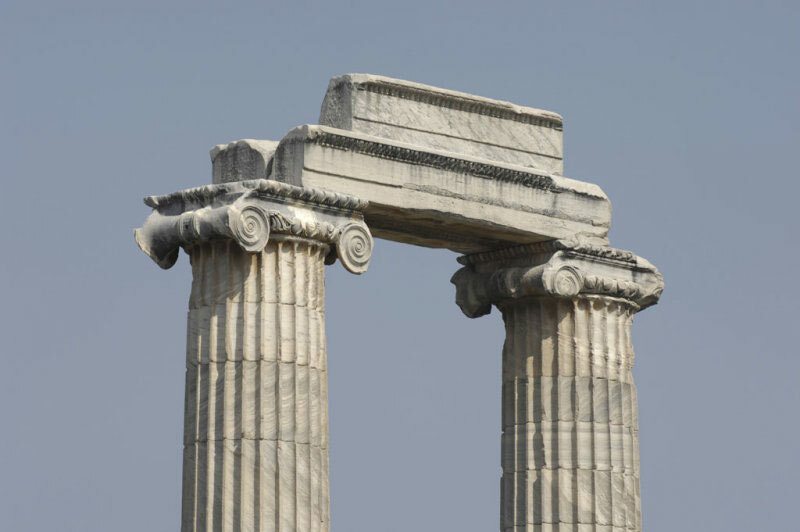 Miletus is also renowned as the first city to which the principles of modern town-planning were applied. Delphinion Temple (shrine as the protector of ships and harbours). Theatre (originally built in the 4th century B.C and enlarged to 15.000 capacity during Roman period). Famous for its gently sloping sandy beaches fringing crystal clear waters, Altinkum means 'Golden Sand'. Its two long crescent beaches lie at each end of the resort, starting at the harbour and finishing at a rocky headland promontory, so providing over 1 km of beach. The sun-warmed waters along this beach are mainly shallow for a couple of hundred meters and are ideal for both supervised children and non-swimmers. Sun beds on the sands make it easy to relax in tan building comfort, or if you are feeling energetic, canoes and pedaloes are available for hire. Catamaran "Aegean Jet" is Swedish built and classed by Italian Classification Soceity RINA. All her passengers are under the third party insurance coverage of "British Marine Protection & Indemnity Club" with a limit of 100.000.000 -USD. The vessel is fully air-conditioned and she provides comfortable seating with aircraft type seats. Nostalgia Travel is not responsible for the content and/or changes in the program! © Nostalgia Travel  / Excursions / Didima.